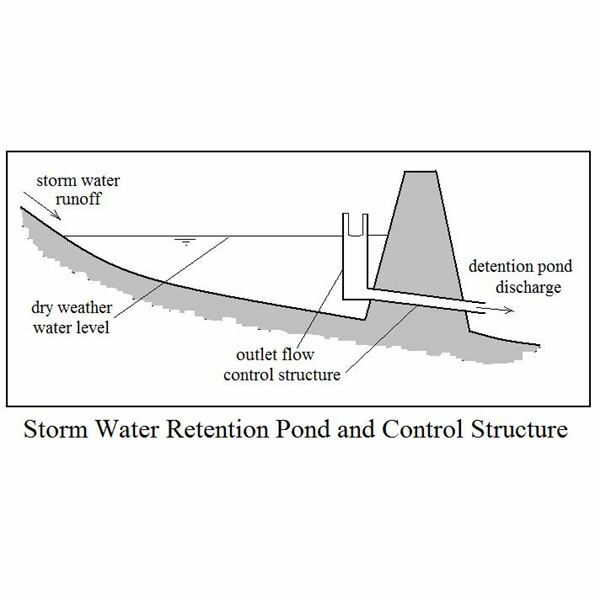 Storm water retention or detention ponds are used to capture storm water runoff from a developed watershed and to release the captured storm water at a rate no greater than the pre-development peak storm water runoff rate. 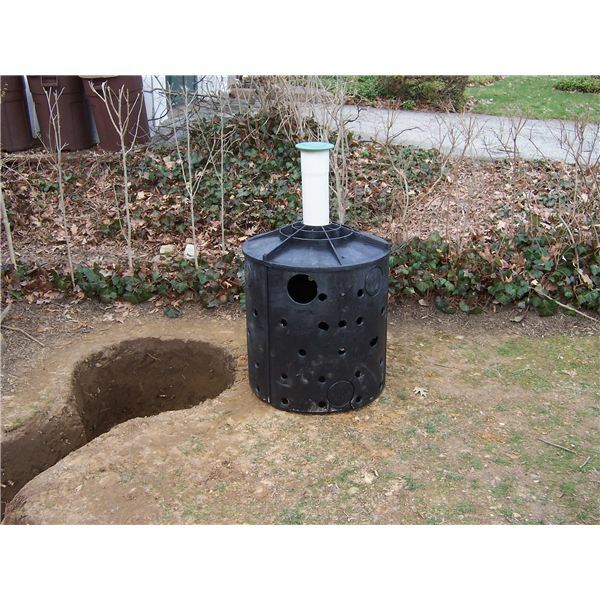 The fundamental requirements are thus: i) adequate volume to hold the captured storm water runoff as it is being released at a slower rate than it is coming in, and ii) an outlet structure that controls the outflow to a rate no greater than the pre-development peak storm water runoff rate. 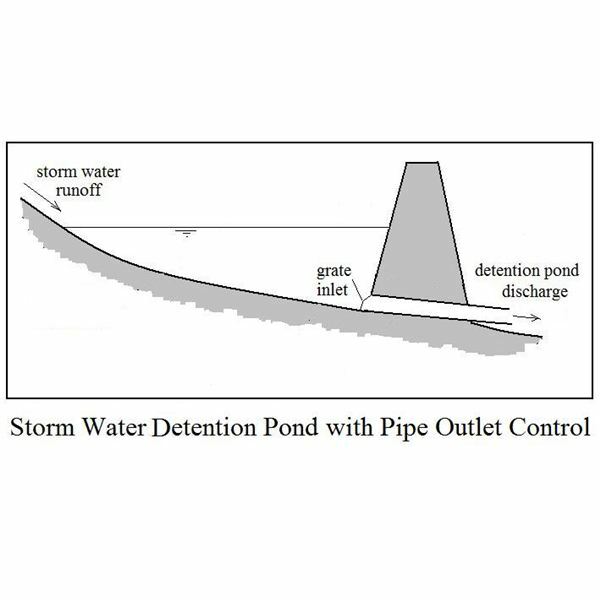 The diagram shows a storm water detention pond and an outlet control structure with an outlet pipe and a riser with a weir. The article, "The Storm Water Detention or Retention Pond – Why Is It Needed?" 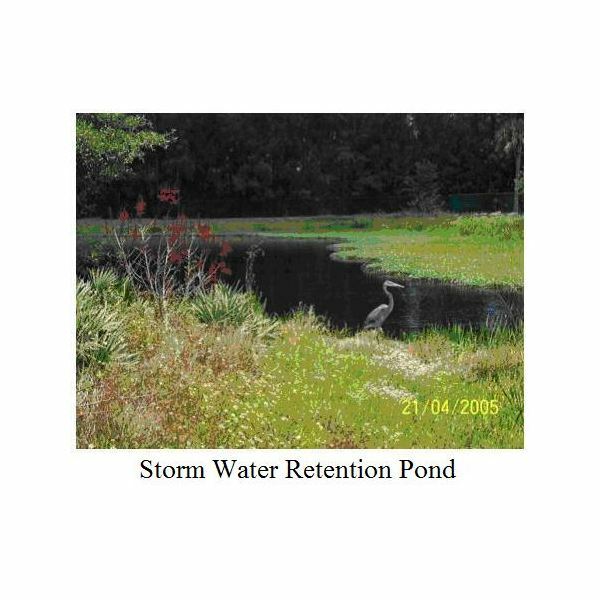 provides more background on storm water detention and retention ponds. 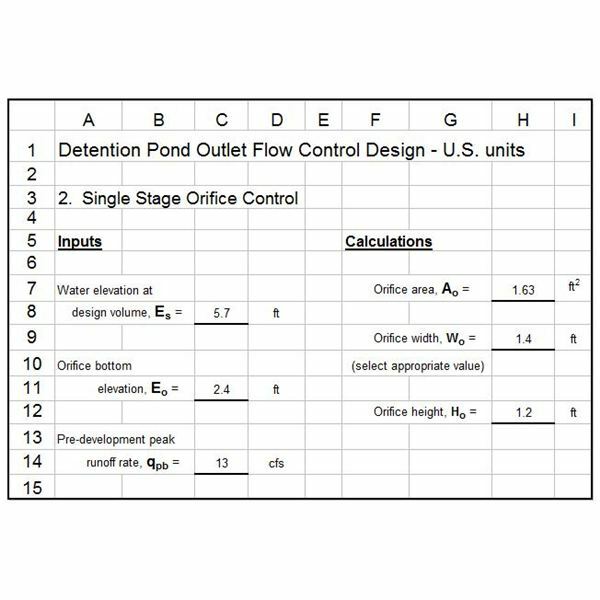 The article "Sizing of Storm Water Detention Ponds with Excel Formulas" gives equations and Excel spreadsheets that can be downloaded to calculate the volume needed for detention/retention ponds. 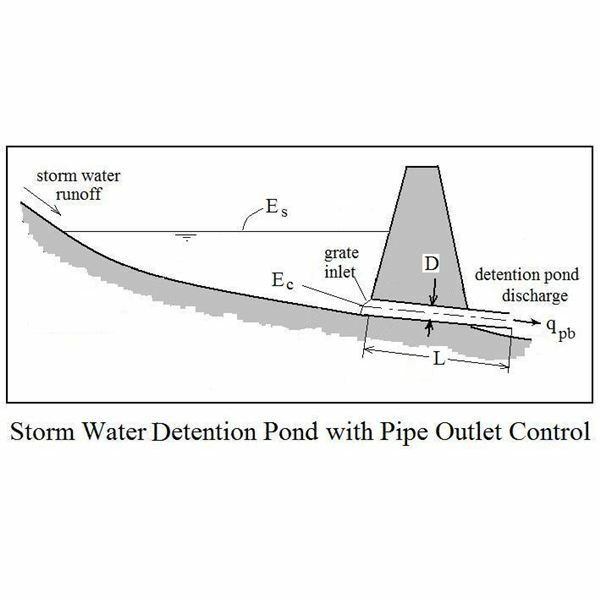 This article is devoted to equations and procedures for designing storm water detention/retention pond outlet structures. 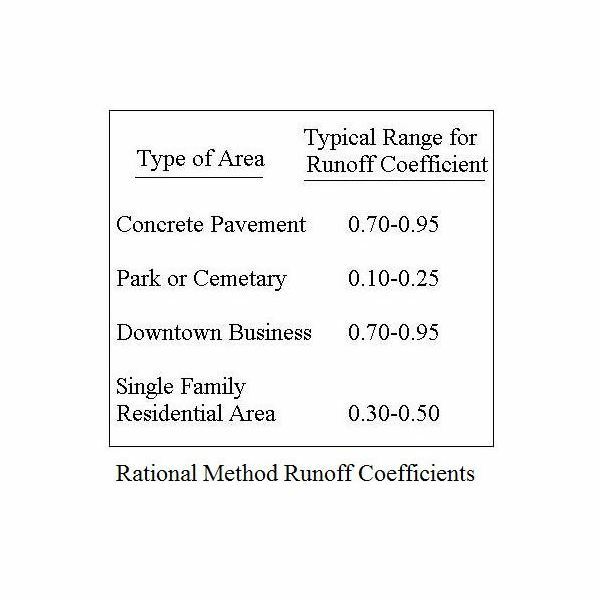 In order to control the outflow from a storm water detention or retention pond to less than the pre-development peak storm water runoff rate, some type of flow constriction is needed. The three types of flow constriction/flow control devices that will be covered in this article are a pipe, an orifice, and a weir. It isn’t necessary to reinvent the wheel in order to make design calculations for a pipe, an orifice, or a weir as a flow control device, because fluid mechanics/hydraulics equations are already in common use for other applications for all three of these. A pipe of appropriate diameter and length with an inlet at or near the pond bottom can be used as the outlet control for a detention pond as shown in the diagram at the upper left. 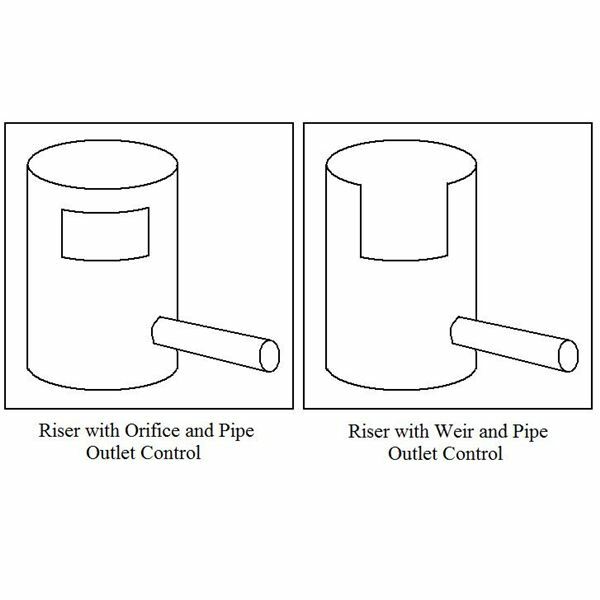 An orifice or weir outlet control will typically be used along with a riser pipe for a storm water retention pond, as shown in the diagram at the right. This type of outlet will drain the pond down only to the height of the weir crest or the bottom of the orifice after a storm event. The use of a pipe for the only outlet flow control, as shown in the diagram above, is an example of single stage outlet flow control. The pipe can be sized to properly restrict the flow for a storm of only one selected recurrence interval. 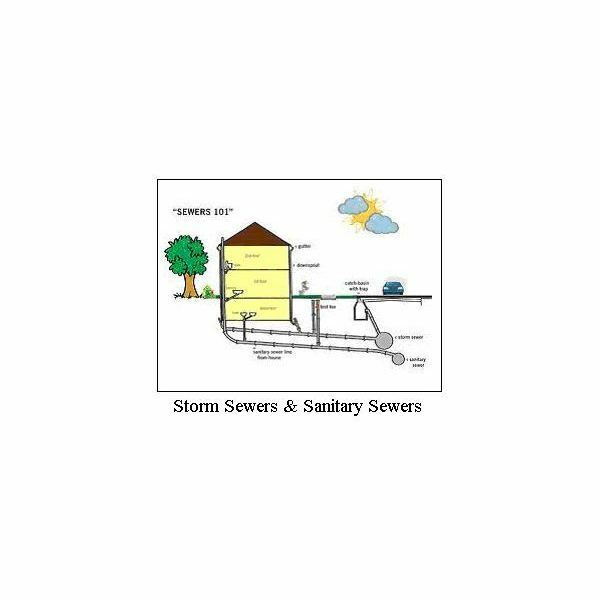 If the pipe is sized to provide outflow at pre-development peak storm water runoff rate for a frequent event (such as a 2-yr or 5-yr storm), then it will over control less frequent events (like a 50-yr or 100-yr storm). On the other hand, if the pipe is sized to properly control a 100-yr storm, then it will under-control a more frequent event. One solution to this dilemma is to design the outlet control for a frequent event, like the 2-yr or 5-yr storm, but provide adequate storage capacity for a less frequent event, like the 100-yr storm. Another approach is two stage outlet flow control. The weir or orifice in a riser with a pipe outlet, as shown in the diagram above can be designed for two stage control. For example, the pipe can be sized to provide the proper restriction for an event with a large recurrence interval, like a 100 year storm. The orifice or weir can then be sized to provide the proper restriction for a more frequent event, such as a 5-year storm. The design storm recurrence interval or intervals to be used will typically be specified by a state or local agency. 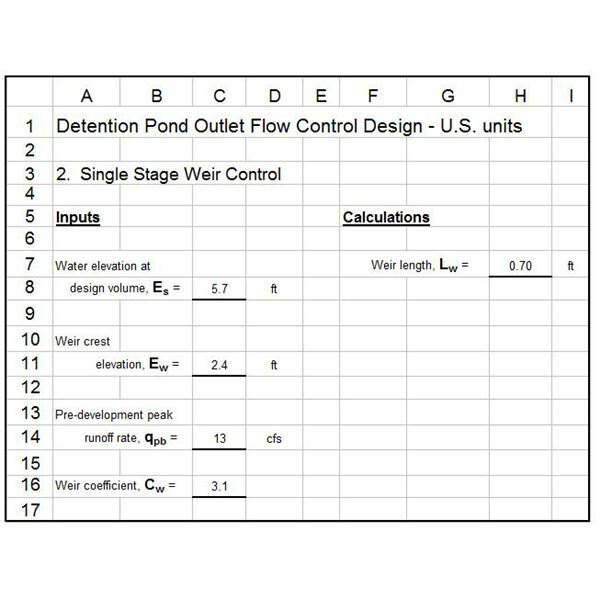 See page 2 for discussion and downloadable Excel spreadsheet templates to design single stage pipe outlet flow control and two stage outlet flow control with a pipe and either an orifice or a weir. 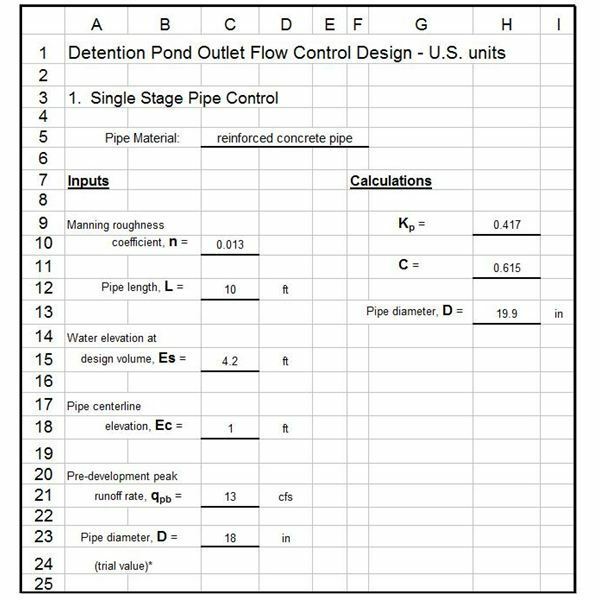 These calculations require an iterative (trial and error) solution, because a value is needed for D in order to calculate Kp, which is needed to calculate D. A trial value of D is chosen to start the process, then with values entered for all the inputs, the Excel formulas will calculate Kp, C and the pipe diameter, D. If the calculated value for D is different from the trial value, then repeat with the trial value of D set at the next standard pipe diameter less than the calculated value. Repeat if necessary. 4, 6, 8, 12, 15, 18, 21, 24, 27, 30, 33, 36, 39, 42, 48, 54, 60, 6" increments up to 180"
Excel spreadsheet templates can be downloaded through the links below to make these calculations in either U.S. or S.I. units. The last section of this article (on page 3) gives information about the parameters and equations in S.I. units. Click here to download this Excel spreadsheet template in U.S. units. Click here to download this Excel spreadsheet template in S.I units. 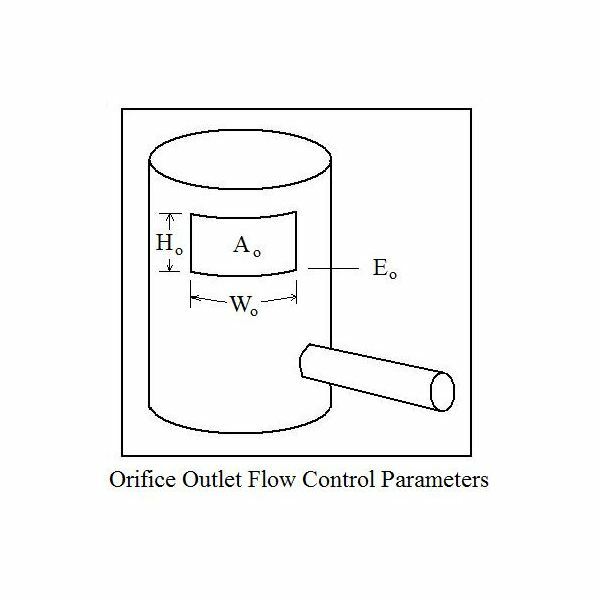 Two stage outlet flow control can be accomplished with an orifice as described here to control a low return period storm and a pipe designed as described in the previous section to control a high return period storm. 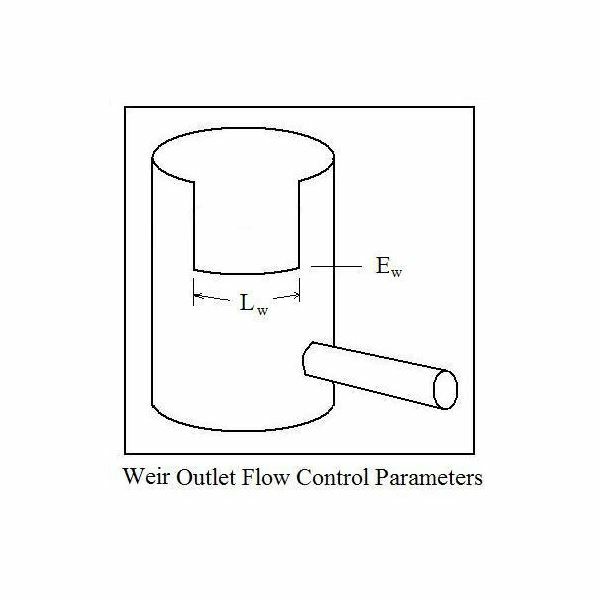 Two stage outlet flow control can be accomplished with a weir as described here to control a low return period storm and a pipe designed as described in a previous section to control a high return period storm. 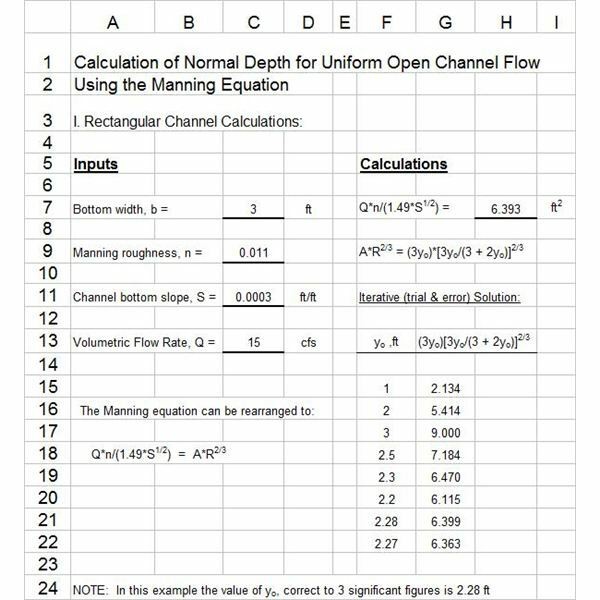 Excel spreadsheet templates can be downloaded through the links below to make these calculations in either U.S. or S.I. units. The next section of this article gives information about the parameters and equations in S.I. units. The equation for calculating the required weir length remains the same ( Lw = qpb/[ Cw(Es – Ew)1.5 ], but the value typically used for the weir coefficient, Cw, is 1.71, instead of the 3.1 value used for U.S. units. 1. McCuen, Richard H., Hydrologic Analysis and Design, 2nd Ed, Upper Saddle River, NJ, 1998. 2. Coefield, S. and Environmental Health News, "EPA to Staunch Flood of Storm Water Runoff Polluting U.S. Waterways," Scientific American, February 17, 2010. 3. Mays, L. W., Urban Stormwater Management Tools, New York, McGraw-Hill, 2004. The Storm Water Detention or Retention Pond – Why is It Needed?